It’s the end of May. GCSEs are already underway and I’m a nervous wreck. Have I prepared my pupils well enough? Have they been doing the revision I set? Did I cover all the themes and characters properly? Can everyone write a PEAL paragraph in exactly 10 minutes? Will they be OK? Have I let them down? I put on pre-exam breakfasts and afterschool revision sessions. I hand out pens and last minute notes and little good luck charms. I feel like a mother of thirty. Then, in ones and twos, they come nervously into my classroom proffering envelopes and little packages. Some of them hug me. Some of them rush away quickly before I can say thank you. I open the envelopes and I cry. Thank you so much for being such an amazing and helpful teacher. Thank you for everything you have done for our class. My confidence in myself had plummeted massively, but with your words of encouragement I picked myself up. You got me obsessed with The History Boys! Thank you for two wonderful years of English! They’ve been great! Thank you for being a brilliant English teacher who always tried to make your lessons fun and enjoyable. Thank you so much for everything you have done for us over the last two years. You’ve been amazing! You’re a bit nutty but we love you! Up and down the country, I know many teachers will have received similar cards and, like me, shed a quiet tear or two over them. I think it’s important, today, as we wait for those results to remember what we did it for. Not for numbers, not for grades, but to share our knowledge and enjoyment of our subjects with a new generation. What makes me proud when I read those cards, is the fact that despite the pressures of covering a new curriculum, despite my stresses and worries as I tried to prepare my pupils for a brand new exam specification, we managed to keep that enjoyment of our subject at the forefront of what we were doing. So much of my own satisfaction over the past two years came from watching those pupils develop from children into confident young men and women who will meet life’s challenges and overcome them. So I just wanted to say thank you too, 11BW. You were the best! I learned as much from you as you did from me and I want to thank you for making me laugh very, very often, for making me tear my hair out on occasion and every single day for making me want to be the teacher you deserve. I didn’t always make it, but you were a tolerant, forgiving bunch and I know that tomorrow, whatever happens, you will meet the future with resilience and confidence. I’m looking forward to being there with you in the morning as we finally achieve #squadgoals2017! I was lucky enough to be able to attend the Research Ed English and MFL conference yesterday. My main focus for the day was to improve my knowledge of how to use research effectively not only to enhance my own teaching but also to help me in the task of improving the design of the KS3 English curriculum at my school. In terms of an overview of how and why to use research, I found the session on the English Teacher as Research Lead extremely valuable. This session focused around the issue of how and why to turn knowledge into action. Dr Gary Jones introduced us to the concept of the ‘knowledge mobiliser’ the person whose function is to turn knowledge into action and summarized some very useful research by Vicky Ward (Ward, 2016) into how to turn knowledge into action. This session provided some really useful pointers for clarifying my thinking about prioritizing our needs in developing our new KS3 curriculum. Gary also discussed the Teacher Development Trust report on Developing Great Teaching (Higgins et al, 2015) which examines the evidence on what makes effective CPD and provides detailed advice on what schools need to consider when planning for effectiveness. He helpfully summarized this as ‘bake it in, don’t bolt it on’: effective CPD focuses on the two or three things that matter, needs to be sustained over time (a minimum of two terms) and, crucially you need to identify the things you will stop doing. I found Gary’s session really helpful as a framework to help process the messages for the rest of the sessions I attended. As head of learning and research at Wellington College, Carl Hendrick is doing the job outlined by Gary Jones, and amid a scathing takedown of enquiry-based teaching methods in English, illustrated by hilarious tales of his hapless experiments with ‘engaging’ lessons at the start of this career (step away from the sugar paper) the serious takeaway from his session was around using direct instruction to reduce the cognitive load on pupils. A short passage from Jekyll and Hyde provided ample evidence that the ‘turn to your partner and discuss for five minutes’ strategy is supremely unhelpful in unpicking complex texts and this was underlined by a quotation from Sweller ‘If the learner has no concepts in long-term memory the only thing left to do is to blindly search for solutions’. I walked away from this session with a reading list that will keep me going for quite some time, bolstered by Carl’s parting message that as teachers it is unquestionably better to spend more time reading the good-quality research that is already out there and less time trying to do our own. Amy Forrester’s session provided an example of how to use research to develop classroom-based teaching strategies that really work. Like so many of us, her KS4 classes were struggling to memorise quotations from their literature texts. Using research on the benefits of retrieval practice (Karpicke et al, 2016) she designed a series of highly-structured tasks that pupils did over an 8-week period. Measuring the number and variety of quotations that pupils were able to use in assessments before and after the 8-week period produced some really impressive results. This session was really helpful for me, because while I was aware of the research and have been, I thought, using it, via adapting Rebecca Foster’s Five a Day starters for my classes, Amy’s adaptation of the concept was so much more rigorous, structured and measurable that it has given me a much clearer roadmap to follow for embedding retrieval practice into my lessons. Another great session came courtesy of Lyndsey Caldwell, Faculty Leader for English at the Cherwell School, who outlined how she has transformed the English curriculum there. Using the example of the play pump (info here http://objectsindevelopment.net/wp-content/uploads/2011/04/10-problems-with-the-PlayPump.pdf ) she pointed out the not uncommon problem within English departments of adopting well-intentioned but ultimately ineffective approaches to teaching and learning. At Cherwell School, three underlying principles have shaped Lyndsey’s approach to the English curriculum: Prioritise Knowledge, Crafted Direct Instruction and Standardised Formative Assessment. She referenced (as did Carl Hendrick) two major findings from Rob Coe’s Sutton Trust report, What Makes Great Teaching (Coe, 2014): Pedagogical Content Knowledge and Quality of Instruction as the guiding principles of her work. Lyndsey put forward an impressive and impassioned case for explicitly building vocabulary in a very structured way from the very beginning of KS3. Again, the importance of using word lists and knowledge organisers to agree and explicitly teach the most important information for each unit of work was stressed. Another fascinating idea for me, was Cherwell’s practice of storing direct instruction lessons on Youtube to enable pupils who have missed out on learning to catch up. Drawing on the work of Hirsch, Lyndsey also stressed the way in which Cherwell have enriched the cultural value of the texts studied while reducing the content of the curriculum and eliminating poor-quality and low-value tasks. Vocabulary instruction was also a theme in the highly enjoyable session from Arlene Holmes-Henderson on research by the Classics in Communities project into introducing Latin in schools. She made a persuasive case for using Latin lessons to help close the attainment gap through its impact on literacy development in low-attaining primary pupils and shared some impressive-looking data from primary schools in a number of areas including Solihull. I have some personal experience of this from having run a primary school Latin club as an enrichment activity and Arlene’s session has refired my enthusiasm for reintroducing this as an enrichment activity for Year 7. Arlene also helpfully pointed out that the organisation Classic for All provides grants to schools to purchase textbooks. Many thanks to all of the speakers and especially to Tom Bennett for organizing it and providing the stand-up comedy. In his opening address he promised a day of ‘all killer, no filler’ and he totally delivered. Research Ed rocks and that’s even without the amazing bonus of meeting all the fab Team English peeps I have followed on Twitter for so long. Roll on the next one, but meantime I have plenty to keep me busy. With only a few weeks to go until the new GCSE curriculum is put to the test, I thought this would be a good time to reflect on what my teaching has gained from three brilliant ideas I picked up from other members of Team English and have put into practice in my classroom. My grateful thanks to, among many others, Andy Tharby, Rebecca Foster and Joe Kirby from whom I magpied the ideas. It was clear to me from very early on that, given the time constraints of the exams, being able to form beautiful – and meaningful – sentences under pressure would be a key challenge for this cohort. I had spent quite a bit of time poring over Andy Tharby and Shaun Allison’s book Making Every Lesson Count and I was eager to try out Andy’s resource 16 analytical sentences which I felt had a lot of potential to help pupils develop a framework to express their ideas. I duly laminated 30 copies and put them with a selection of other resources on the help bar on my classroom windowsill. My fear was that using a resource like this might be too prescriptive and overly scaffold pupils’ responses, but I think it has had the opposite effect, as it has allowed them a framework within which to develop their thoughts, leading to more considered and reflective comments about the text. One important thing I did learn was that, to get the best out of this resource, it is important to model using the sentences to construct an analytical paragraph before letting them loose with the hand outs. Many thanks to @TLPMrsF for this one. Again, I had been reading around the idea of memory and retrieval and wondering how I should go about building memory platforms into my KS4 lessons. I happened on Rebecca’s 5 a day starters and decided to open each KS4 lesson with five questions on a Powerpoint slide that mixed up current and previous topics. 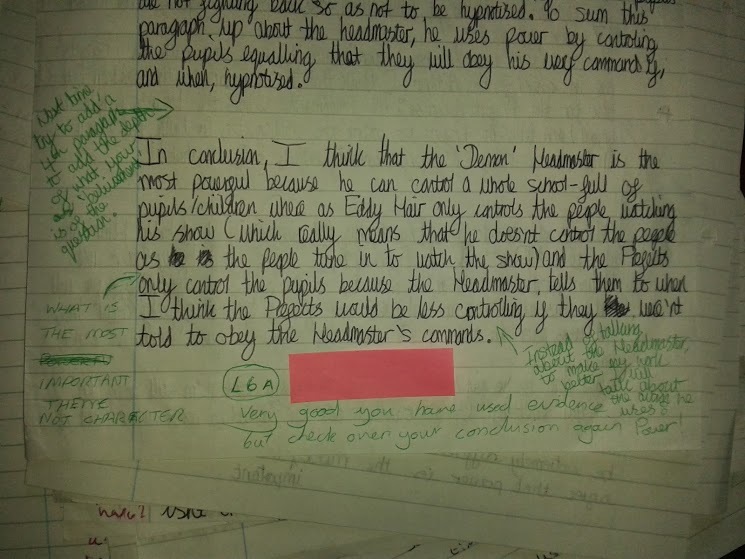 It took a few reiterations of the thinking behind it for pupils to understand the purpose of these, but they have grown to enjoy testing their knowledge against them and it has definitely had an impact not only on memory but also on their ability to see thematic links between the various texts. I’ve linked to one here as an example. The beauty of this is that they only take a few minutes each week to create and are infinitely reusable, particularly if you mix them up and retest every couple of weeks. Obviously, these have been extensively discussed on Twitter but it was @joe­_kirby with this blog post that first drew my attention to their potential in distilling the key knowledge required for a topic or text. I made some of my own, borrowed and adapted some from the collection curated by @jamestheo and my classroom windowsill is now home to a wide array of class sets of laminated organisers to be handed out for a quick memorise and recall starter or to help with planning and writing essays. Next year, I plan to issue personal copies to pupils at the beginning of each unit, as Michaela does, and set learning from them as homework to be tested in class. These are just three of the things I have put into practice this year that I probably wouldn’t know about were it not for Twitter and #TeamEnglish. Thank you all for creating such an amazing community. With only six weeks of teaching left before the exams, my pupils are beginning to worry about memorising quotations. I started off the year with a somewhat aspirational post on our class website asking them to commit 10 minutes a day to memorising key quotations and suggesting various ways they could do that. We have created class sets of quotations on Quizlet and I have been doing five a day memory starters all year, testing them on quotations from all of our class texts. I have shared various revision strategies over the course of the year and talked quite a bit to them about the various things I have been learning about the science behind learning and memory. In fact, I was beginning to feel a bit smug. However, I recently realized that despite all of this, not all of my class are yet confident in remembering a wide range of quotations, while for a few panic is beginning to set in. Enter stage left the hero of the hour, Mr Bruff and his Power and Conflict rap. For those who haven’t heard it yet, he has taken one key line from each of the anthology poems and fused them into an annoyingly catchy song which I shared with my class last Friday afternoon. I started the lesson by giving them a handout with the lines on made by the colleague who had originally alerted me to the rap and asking them to name the poems they come from. I then played the rap, but the class was reluctant to join in, although they very much enjoyed the spectacle of me gyrating like a crazy person at the front of the room trying to drum up some audience response. When I then put them into groups and asked them to create their own memorisable poems using one line from each of the anthology poems, they set to enthusiastically and came up with some clever amalgamations. This didn’t solve the problem though. How are they going to remember the poems in the panic of the exam hall? As I have explained to them, we can’t afford to spend a lot of class time on this. I decided to revisit the rap yesterday and see how much they could remember. This time I asked them to take their handouts out and spend three minutes memorizing two quotations. I asked them what strategies they were going to use? A surprising number couldn’t think of any, even though I think I have given them quite frequent updates on effective memorisation techniques. I suggested a strategy – look, cover, write, check. When the three minutes was up, I initiated an I say – You say –­ call and response session, where I called out the name of the poem and the class had to respond with the line. Once I had run through all 15 lines they were keen to try it along with the video and this time I wasn’t rapping on my own! I followed this up by having them take out their anthologies and with the help of Mr Bruff’s accompanying 15 minute analysis video they speed annotated half the lines (I’m saving the other half for next Friday) with his ideas. Then I asked them to choose two of the lines and create an exam style question linking them together using a theme map. They finished by planning an answer to the question before going into a silent 10-minute write to produce a detailed analytical paragraph comparing the two quotations. Next week we will repeat a similar exercise with the rest of the quotations. In the interim, I plan to use I say – You say as I take the register each lesson to make sure they really know the lines. Obviously, I’m not suggesting that learning one line from each poem is going to be sufficient to see my pupils through the poetry section of the exam. They clearly need to memorise a range of key quotations, and most of them have quite a few at their fingertips. But we all know that panic breeds amnesia and in the stressful situation of a large exam hall, I am hoping that Mr Bruff’s catchy beat will ensure that at the very least all of my pupils have one quotation from every poem at their disposal – and even more crucially that they have practiced creating an analytical paragraph around it. Predictably, yesterday’s book launch at Michaela School has generated much more heat than light on the corner of the Twitterverse reserved for the educaterati. I have to admit that when Michaela first launched, I was extremely sceptical about its ideology and loath to accord it any credibility. However, gradually my views began to change. Seeing Jo Facer speak with authority about the Michaela take on teaching reading at ResearchEd Swindon last year prompted me to follow her blog and those of other Michaela teachers. And I liked what I read on a practical level, even when it conflicted with my views about how teaching ‘ought’ to be. I started to question to what extent I might inadvertently be practicing ‘the soft bigotry of low expectations’ to quote He Who Must Not Be Named. Obviously, I’m not ever going to go so far as to suggest that Gove had a point, but equally I started to feel that I couldn’t let ideology stand in the way of figuring out what works best for pupils. Then, this year I read Reading Reconsidered. Here was Doug Lemov promoting a rigorous approach to close reading that resonated with me and looked very similar to the methods advocated by Michaela. I started cutting down the time spent on fancy powerpoints and putting it into planning detailed sequences questions on the texts we were studying in class. Group work features less in my lessons now and I question more deeply and thoroughly. The texts I choose for my pupils are more difficult – and richer in meaning – than before. Am I going over to the dark side? At least, I am going over to the idea that there is no dark side. When I saw the Tiger Teacher launch promoted on Twitter I signed up. Out of curiosity of course. Because, here’s the thing. Like every teacher I know, I want the best for my pupils. If you believe (and anyone who saw the passionate conviction of the Michaela teachers yesterday couldn’t doubt for a moment) that Michaela really thinks that they are making a difference to the life chances of the pupils in their care, then why wouldn’t you want to find out what they are doing and how it works, and if it might just possibly work for your pupils too? Why would you allow your ideological convictions to get in the way of improving the outcomes of the children you educate on the basis of a couple of Twitter spats and some ill-informed comments? We are professionals after all; surely we want to weigh up the evidence before we come to judgement? So here are my takeaways from yesterday. Yes, the behaviour system sounds extreme, but it is coming from a place of care and love – that was really clear. The philosophy behind it was well thought through and aims to give pupils the tools to grow emotionally as well as intellectually. Every teacher I met was passionate about social justice and positively evangelical about their mission to equip pupils to succeed and excel in the world beyond school. It is early days, but I am willing to bet that come 2019 their GCSE results will be spectacular. And I will be delighted for them. Because, hopefully, as a result of what I learned yesterday, my own pupils will have benefited too. ‘I wish my whole Year 11 class could be here with us’, I said to my husband as we sat sipping wine in a Venetian café overlooking the Campo del Ghetto Nuovo a couple of weeks ago. ‘Have you taken leave of your senses?’ he enquired (only slightly less politely than that). We were about to watch a historic performance of The Merchant of Venice staged in the heart of the Venetian Ghetto: the first time the play has ever been performed there. The production, the work of an international cooperative, was thoughtful and complex. It grappled, as every production of the play must, with the issues of how we can, or even if we should, interpret the play in the 21st century. Putting on a play like this in a place with such resonance doesn’t lend itself to simplistic interpretation. I first studied The Merchant in Venice as a 15-year-old schoolgirl in an Irish village in the 1970s. Back then I had only the haziest notion what Italy might be like, much less 16th century Venice. I had, in fact, only one point of connection with the play: through reading it I became conscious of my own suppressed Jewish heritage. The story resonated with me: my Jewish grandfather had been forced to agree bring his children up Catholic in order to be allowed to marry my grandmother. I was immediately on Shylock’s side; how could a person with feelings not be? Thirty years later, sitting in the hot sun in the Venetian Ghetto I can still recite the play practically word for word along with the actors. Over the years, my feelings about the characters have shifted. Many of my students, like myself at the same age, feel passionate sympathy for Shylock. He is the underdog. Spat on, hated, insulted, robbed of his possessions and the love of his daughter. How can you not empathise with his desire to seek revenge on the smug self-righteous Antonio? Are we ever answered? I hope not. To keep on having new, questions, different questions, to probe deeper, to look harder, to see a new angle on an old debate – that’s what I want for my pupils. I want them, in 30 or 40 year’s time, to be watching a production of The Merchant of Venice and to say: “I still have questions but they are different questions”. If I can teach one lesson this year, I hope it is that questions are more interesting than answers. And that the more complex the text is, the more difficult it is to interpret, the better the questions we can ask of it. Cultural capital matters. If I hadn’t had to learn the play in school all those years ago, maybe I never would have found myself in the Campo del Ghetto Nuovo two weeks ago. I need to open those doors for my pupils too. I have modelled these extensively with all my classes – first practising sentences in isolation, as recommended by Andy, and now handing out the laminated sheets every time we do analytical writing to help them to structure their ideas about the text we are working on. It also really helped boost my Year 8 pupils’ confidence to learn that they were working with exactly the same resources that were being used with my top set year 10 and my Sixth Form students. Inspired by this, I decided to copy the Deep Language Analysis – Writer’s Palette that Andy and Shaun Allison created in their book Making Every Lesson Count. This has also proved a really useful tool – particularly for year 10 as they learn to structure exam answers – as pupils either use it as a step by step guide to constructing an answer or they can quickly scan the sheet for help if they get stuck on what to do next. These have a multiplicity of uses in class – they can be used as support for pupils when engaged on a task, revision aids, memory tests and starter activities. I have made or borrowed (my heartfelt thanks to everyone who has shared theirs) knowledge organisers for all my Key Stage Four texts now and expect that the investment in time in creating, printing and laminating will be more than repaid by the repeated use I will get out of them over the next few years. And best of all, every time I use them I feel grateful to be part of the amazing community of Tweachers who share their resources so generously with the rest of us. I was going to illustrate this blog with a photo of my shelf of books on how to teach real good like a proper teacher should, but I couldn’t stand back far enough to get them all in. 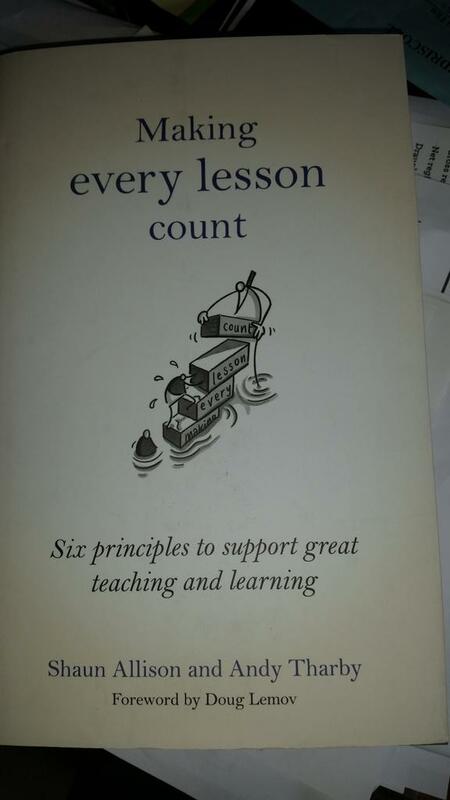 They are all going in the bin now, anyway, because I have just finished reading the One Book to Rule Them All – Making Every Lesson Count by Shaun Allison and Andy Tharby. It should be fairly obvious that a teaching book is only going to be really useful if it is based on principles that you can integrate into your practice and because Allison and Tharby have based their work around two of the books that have most profoundly influenced my teaching recently, Ron Berger’s An Ethic of Excellence and Carol Dweck’s Growth Mindset, I found Making Every Lesson Count really helped to extend my thinking on how to improve my practice by implementing these ideas in the classroom. Obviously, there is a lot to be said about Growth Mindset and the various ways in which it is being understood, or misunderstood in schools at the moment, but the most important take away for me was that I should be doing more to explicitly promote the idea of the struggle state as a positive mentality among my pupils in the pursuit of excellence. The book is organized around what most teachers would recognize as six of the fundamental pillars of classroom practice: Challenge, Explanation, Modelling, Practice, Feedback and Questioning. What Allison and Tharby. Everything is research-evidenced and backed up with practical examples from the author’s own classroom experience and there is a bullet-pointed planning and reflection tool at the end of the book to act as a reminder on the key strategies to implement into your own lesson planning. In the past, the problem I’ve found with reading an inspiring book is that you rush off half-cocked and try to shoehorn everything you’ve read into your teaching all at once, with the predictable result that you lose sight of the improvements you want to see in pupils’ learning in a welter of ill thought out initiatives. The beauty of this book for me is that first of all it is building on principles I have already built into my classroom practice from Ron Berger and from Andy Tharby’s own brilliant blog Reflecting English and secondly that the authors are very clear on how to put all the pieces of the teaching and learning jigsaw together. So things that I was already doing like live modelling, and deliberate practice are explained in detail and linked to current research in a way that has helped to refine my thinking on how to use them to underpin my planning. Using the SUCCES stickability techniques to make my explanations more memorable. The beauty of this book is that the ideas suggested not activities or gimmicks but carefully thought out strategies that are linked directly to the core principles of teaching and learning. I am excited about going back into the classroom next week and using them to take my practice up to the next level. As the authors point out early on in the book – growth mindset applies to teachers as well as pupils. Whenever I worry that I may not be a born teacher (and I don’t believe any of us haven’t had those days) I can reflect on the value of my struggle to become one and how helpful this is in understanding how to help my pupils. The book that most inspired me this year was Ron Berger’s An Ethic of Excellence. I decided if I was going to try one new thing in the classroom that would really make a difference to pupils it should be his ideas about focused critique and redrafting as I wanted to see if I could make a difference to my pupils’ perceptions of when a piece of work was ‘finished’. I started the year by showing each of my classes the famous video of Austin’s Butterfly and introducing the concept of DIRT time. Interestingly, my Year 7 and 8 classes got the idea straight away. 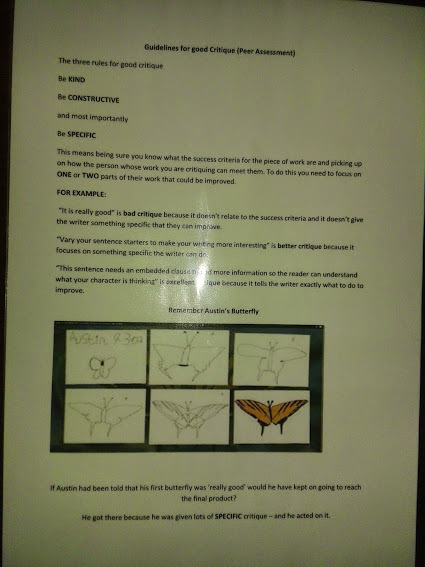 They were blown away by the quality of Austin’s final butterfly drawing and the progress he had made and we had productive discussions about the value of redrafting and not giving up .Initially, however, they did not fully appreciate the strong connection between the quality of the feedback given and Austin’s capacity to improve his work. With my older classes, the first viewing of the video was not as successful. They were dismissive of the idea that they had anything to learn from a six year old and could not see past this. I left it and then showed them the video again immediately preceding their next DIRT session. This time I was more insistent that they engaged with the ideas being presented. My next step was to make up DIRT bags to hand out to each table of four every time we were engaged in writing or redrafting. These contain a green pen for each pupil, an A3-size pupil-friendly version of the reading and writing levelled assessment focus levels for English and two laminated cards, one giving instructions on how to do good self-assessment and a similar one for critique (I chose to use this term with all my classes interchangeably with peer assessment). The self-assessment card is headed HOW TO GREEN PEN YOUR WORK and contains a checklist of the different SPAG features pupils need to check before I will read their work – they have learned that I will not read anybody’s work unless I can see self-corrections in green pen on it already. The peer assessment card contains explicit instructions on how to give good critique, focusing on the three key points: be kind, be constructive and be specific and giving examples of the difference between good and bad critique. I finished every DIRT session by getting pupils to feed back to the class examples of helpful or not so helpful critique they had received from their classmates and explaining how they had changed their work in response to this critique. As a result, we gradually built up an expectation in pupil’s minds that they had an entitlement to receive specific and helpful critique that was linked to the success criteria for the work in progress. By examining examples of bad critique as a class, we also built up an understanding of what was not helpful so comments like ‘your handwriting isn’t very good’ were gradually cut down on if not entirely eliminated. Another important facet of this approach proved to be getting pupils to sign their critique. This not only encouraged them to take ownership of the feedback they were giving, but also ensured that when marking students’ work subsequent to a critique session I was able to give feedback on the quality of the critique. This then led on to my next step, which was to create a new role for pupils who had proved the quality of their critique. I called these pupils Peer Assessment Leaders. I rolled out the Peer Assessment Leader concept initially in Year 8, and quickly had 12 pupils whose critiques merited having the purple Peer Assessment Logo on their folders. I then used these pupils as a resource during DIRT sessions, asking other pupils to have their work checked by a PAL before starting to correct or redraft it. When marking work, I photographed particularly good examples of critique and created a display board that pupils could refer to if they needed guidance on improving their critique. By the end of the year all my Key Stage 3 classes were using critique confidently to improve their work, although my Year 8 class were still by far the most skilled. My end of year data showed very good progress right across each class group, at least part of this is attributable to the way in which pupils were able to use critique to improve their work. Looking at how I could improve my approach for next time around, I think the key difference between the Year 7 and 8 classes and my older classes in terms of how well they engaged with the process was down to the amount of time I felt able to spend on the redrafting of work in class. With the younger classes I had more freedom to focus on improving writing so we took our big pieces of work slowly, whereas the sheer volume of work that needed to be got through with other year groups precluded this approach. Next time, I will make redrafting as we go along a higher priority and also incorporate more opportunities for slow writing into our classwork.